I wanted to take this opportunity between Thanksgiving and Christmas to share with you a completely non-holiday-related treat that can’t be ignored any longer. I actually made this ice cream sometime in October, but birthdays and fall-inspired treats kept popping up with more time-sensitive agendas for the blog. Sadly, the last pint of this was finished off weeks ago, but I’ve resurrected the pictures and recipe because it definitely deserves some time in the spotlight before red, white, and green treats start taking over the blogosphere. 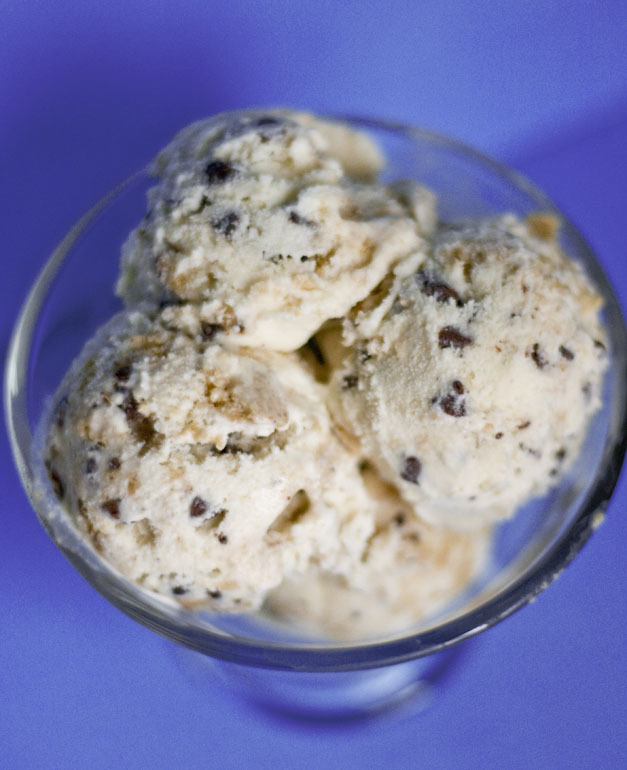 The ice cream is like good ol’ Cookies ‘n Cream , but instead of Oreos, it’s got loads of chocolate chip cookie crumbs. I chose to use store-bought cookies for the ice cream in order to simplify the recipe for myself, but obviously homemade would be great if you have the time or batter on hand. I figured a crunchier CCC would be best to avoid mushy cookie pieces, so I went with the Pepperidge Farms Dark Chocolate Chunk cookies and they worked really well. They’re super crunchy, have great flavor, and one bag is just enough for this recipe. I did bake off a few Jacques Torres chocolate chip cookies from a frozen batch I had to make some softer cookies for ice cream sandwiches. The ice cream itself tastes like a chocolate chip cookie ice cream sandwich, so cramming it between 2 homemade CCC’s might be ridiculous, but absolutely delicious. Paired with a new Glee episode, a stack of napkins, and a tall glass of milk — this was one amazing dessert. I love chocolate chip cookie dough ice cream (and frozen yogurt, too! ), but let’s face it, once the cookie dough pieces are picked through, it’s just vanilla ice cream with a few specks of chocolate chips. Boooooooooring. 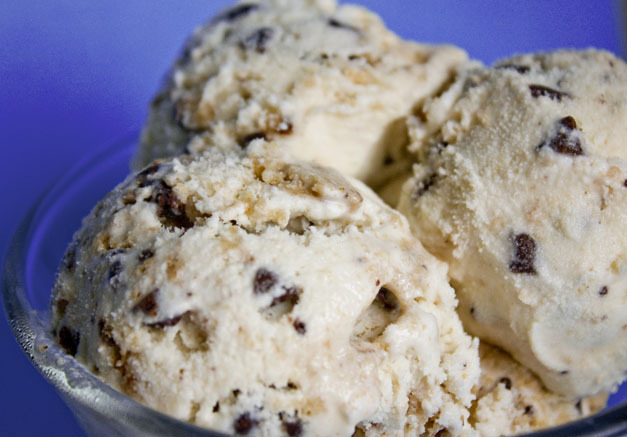 This ice cream solves that dilemma by really distributing the chocolate chip cookie flavor throughout every bite. The finer you crush your cookies, the more dispersed the flavor will be — so keep that in mind when you’re crunching them by hand or in a food processor/blender. I like a few larger bites of cookie in my ice cream, so I kept an eye on the crumb size as I pulsed by food processor. The result is a nice mix of fine crumbs and big chunks to keep things interesting, along with a few chocolate chips sprinkled in for good measure. This recipe is not custard-based so there’s no tempering of egg yolks, making it as basic of a recipe as you can get for ice cream. Sure custard adds extra creaminess, but this custard-less recipe still results in a smooth ice cream with a few less dishes to wash (and no raw eggs to worry about). 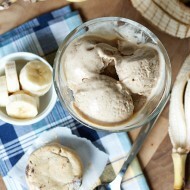 So if you’re craving a flavorful ice cream without much of a fuss, I highly recommend you give this recipe a try. There’s no peppermint, red/green sprinkles, or glittery bows involved here, but I’d suggest giving your holiday taste buds a break for a new twist on an ice cream classic. – In a medium-sized bowl, whisk together milk and sugar until sugar is almost completely dissolved. – Mix in the cream and vanilla. – Pour the mixture into the ice cream machine and run according to the manufacturer’s instructions (mine takes about 25 minutes). 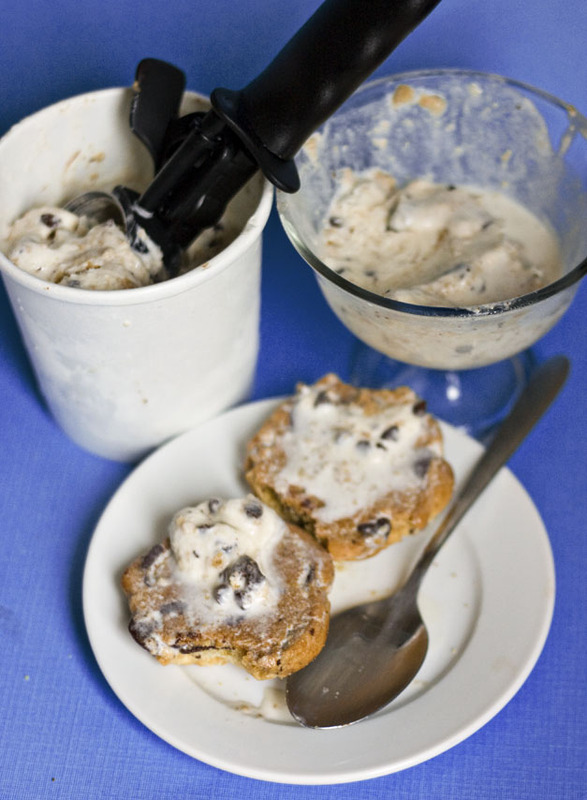 – While the ice cream is going, use a food processor, blender, or ziploc bag and rolling pin to crush up cookies to desired crumb size. Combine crumbs with mini chocolate chips. – When there are 2 or 3 minutes left in the ice cream machine, add the cookie/chip mixture to be distributed evenly throughout. 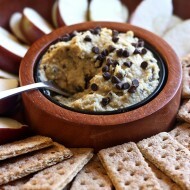 – Transfer to a freezer-safe container and freeze for 1 to 2 hours before enjoying. What a delicious mess I had on my hands after photographing! this looks delicious. 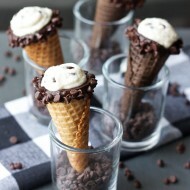 i just got an ice cream maker attachment and i think this will be my first recipe….love your blog! 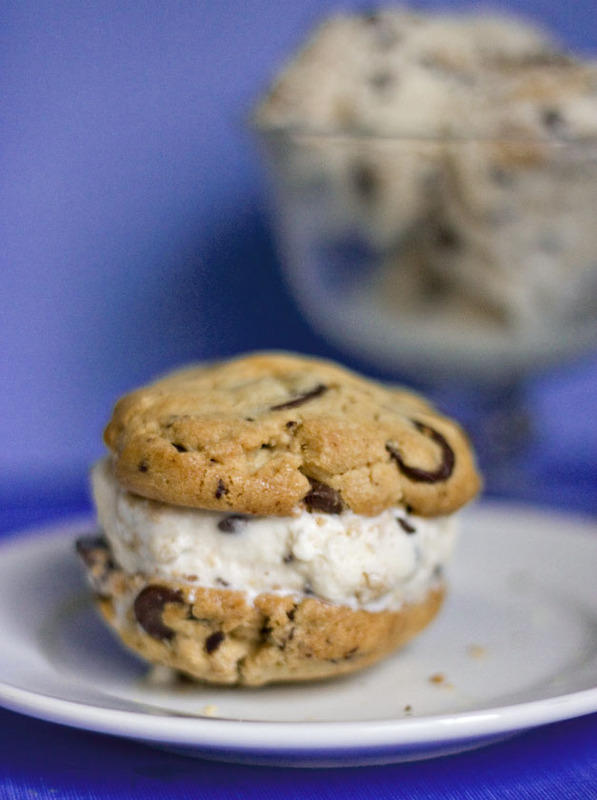 Oh my goodness that picture of the ice cream sandwich… Looks SO GOOD! This is what I miss about summer..
wow! this picture has my mouth watering… I cant wait to try this!! !